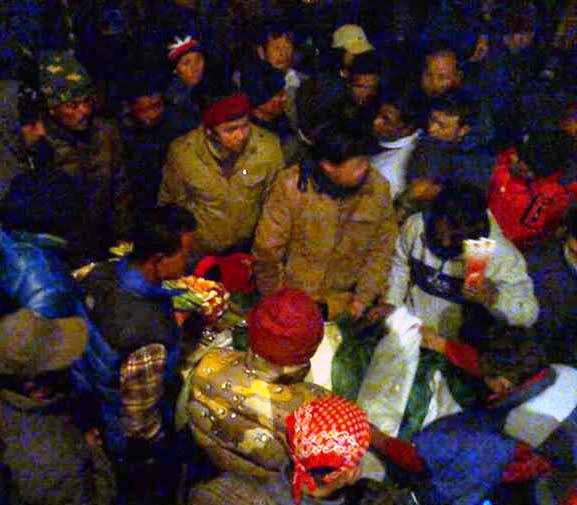 The mortal remains of Subash Ghisingh, the founder of Gorkha National Liberation Front (GNLF) who died in a hospital in New Delhi on Thursday, reached his house in Darjeeling on Friday amid tight security. [Subash Ghisingh died 29 January 2015] Ghishing's body was brought to his Zakir Hussein Road house in Darjeeling after it reached Bagdogra Airport this afternoon by a large number of GNLF supporters and leaders and a strong police contingent. "Ghisingh's body will remain at his Darjeeling house tomorrow for people to pay their last respect and on Sunday, the body will be taken to his ancestral village of Manju near Mirik and cremated there," said M G Subba, Darjeeling town committee president of GNLF. Subhash Ghisingh, once the uncrowned king of Darjeeling who championed the cause of Gorkhaland, died in a hospital in New Delhi yesterday after suffering from liver ailments and cancer for the last few years. With a demand for the separate state for the people of Darjeeling, Ghisingh coined the term "Gorkhaland" and launched a violent movement in Darjeeling in 1980 under the banner of GNLF, thus turning the queen of the hills into a battlefield where bloodshed and killings became an order of the day, leading to deaths of more than one thousand people till 1988. After the intervention of the then Prime Minister Rajiv Gandhi and West Bengal Chief Minister Jyoti Basu, a historic tripartite agreement was signed between the Centre, state and Ghisingh, thus leading to the formation of an semi autonomous body, Darjeeling Gorkha Hill Council (DGHC) in 1988.